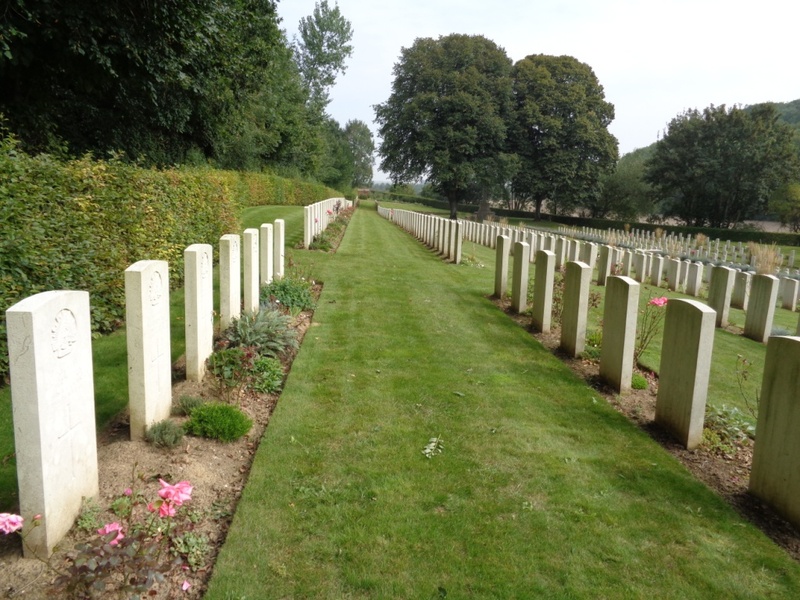 On 4th September 2014 Stephen and I drove to Contay British Cemetery, which is located on the outskirts of the village of Contay on the road to Franvillers. Contay is about 19.6 km north east of Amiens in the Somme (Picardie region), France. According to the Commonwealth War Graves Commission website http://www.cwgc.org/, Contay British Cemetery was used for burials from the 49th Casualty Clearing Station from August 1916, and later from the 9th Casualty Clearing Station, until March 1917. It was then used again for burials from the 38th and other Divisions from April to August 1918. There are 1,133 First World War burials in this cemetery. James Crawford, a Scottish born farmer per his service record, who joined the Coo-ees at Gilgandra, is the only Coo-ee buried in this cemetery. On the 31st August 1916 during the Battle of the Somme Private Crawford received a gunshot wound to his back. He was evacuated to the 49th Casualty Clearing Station, where he died of his wounds on the 3rd September 1916. The photograph below shows Contay British Cemetery. James Crawford’s grave is the first one visible on the left, which is in the first row. 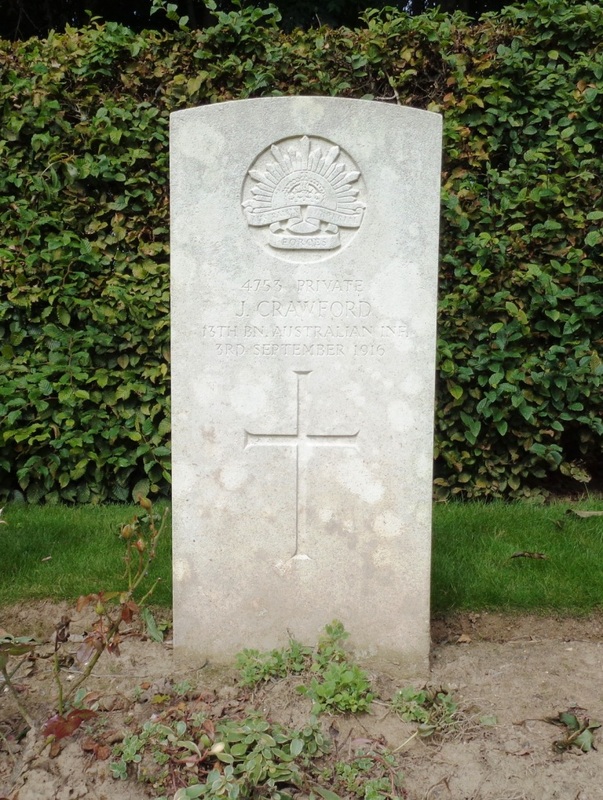 A photograph of the headstone on James Crawford’s grave from our 2014 visit will be placed on his individual blog entry, and form part of a Roll of Honour for the fallen Coo-ees on this blog. Per his military service record (regimental no. 4753), James Crawford was born in Glasgow, Scotland. He gave his age as 38 years, his marital status as single, and his occupation as farmer. His description on his medical was height 5 feet 5 ½ inches tall, weight 11 stone 7 lbs., with a fair complexion, bluish grey eyes, and fair hair. His religious denomination was Anglican. He completed his medical on the 8th October 1915 at Gilgandra and was attested by Captain Nicholas on the 9th October 1915 at Gilgandra. He claimed to have had no previous military service. His surname looks like “Crowford” in his signature. On his embarkation roll his address at time of enrolment was Gilgandra, N.S.W., and his next of kin is listed as mother, Mrs E. Crawford, Hull Head, Castle Fern, Donegal, Ireland. Private Crawford departed Sydney on the HMAT Star of England on the 8th March 1916. He arrived in Egypt on the 11th of April 1916. On the 7th of June 1916 Private Crawford left Alexandria aboard the Transport Ionian bound for France, arriving at Marseille on the 14th of June 1916. On the 31st August 1916 during the Battle of the Somme the 13th Battalion was being relieved from the vicinity of Mouquet Farm, France when he received a gunshot wound to his back. Private Crawford was evacuated to the 49th Casualty Clearing Station, where he died of his wounds on the 3rd September 1916. He is buried in the Contay British Cemetery, France. Private Crawford’s name is commemorated on panel 68 on the Australian War Memorial First World War Roll of Honour. His name is also listed on the Cooee March Memorial Park Gateway (Gilgandra).